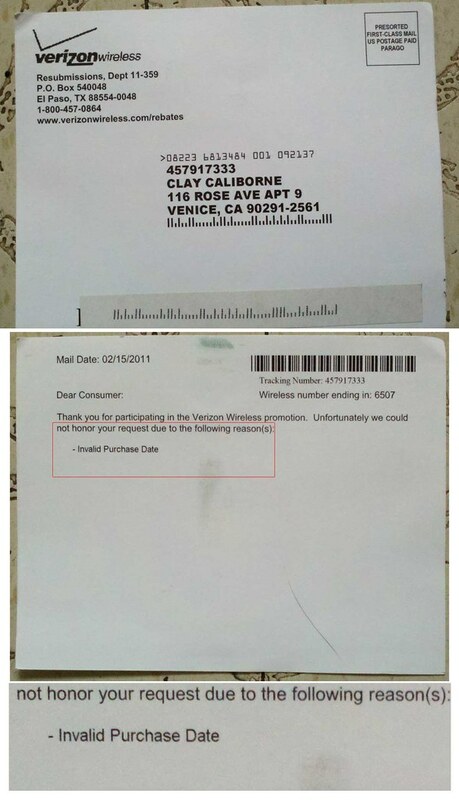 Verizon Denies my Rebate! Am I dealing with Crooks and Liars? So many people have been telling me that I had to get a smart phone that I decided to get one when my Verizon contract qualified me for a discount on a new phone after January 23, 2011. The evening of January 30th I went on-line to Verizon Wireless, logged in to my account and went shopping. I picked out a Motorola Droid X. The website said that with the $100 mail-in rebate they were offering me, this phone would cost me $169 plus tax. I understand how mail-in rebates are suppose to work and I know that the tax is charged on the full price of the phone so I was not surprised when the Verizon website asked me to charge $325.56 on my credit card. The phone came via FedEx a few days later. This Customer Receipt was enclosed. 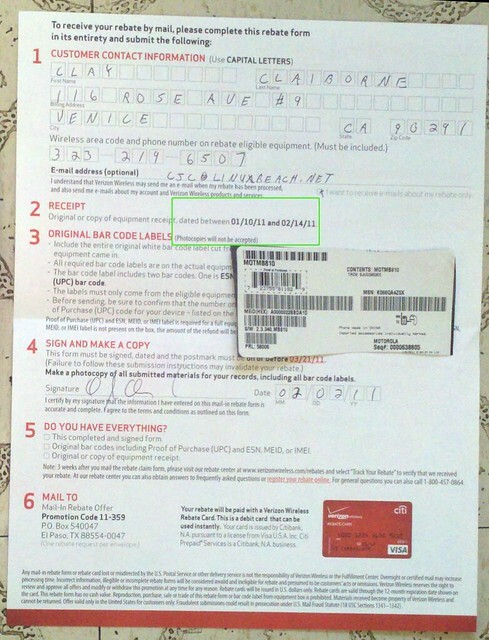 Please note also the detailed blowup of the red box here referencing the enclosed rebate form. I filled out the rebate form, made the copy below in case I needed it for proof. Good thing I did that. Then I made sure I had crossed all my T's and dotted all my i's and I mailed it in on February 2, 2011. Please note also the detailed blowup of the green box on this form referencing qualifying dates. Also note that photo copies are not accepted. This gives them a good out when they 'mis-place' your originals. So imagine my surprise when only a few weeks later, and coincidently, a few days after the 14 day period in which I could return the phone without penalty had expired, I received this postcard informing me that they would not honor the rebate because I had an "Invalid Purchase Date." They didn't spell my name right but that's not what bothers me. I mean how can I have an "invalid purchase date" if I bought the phone on-line and they offered me the rebate at the time I made the purchase? Did they offer me a fake rebate? It boggles the mind! On February 19 @ 4:05pm PST I called Verizon customer service and talked to Mike. I spent 12:49 minutes on the phone but I got no satisfaction. Mostly Mike insisted that the rebate was handled on the website and I didn't have to mail anything in. The form had been in the box because that's what they do, Mike said. The post card was a mistake, Mike said. Mike insisted there was no problem. So I asked Mike what his records showed I was charged. 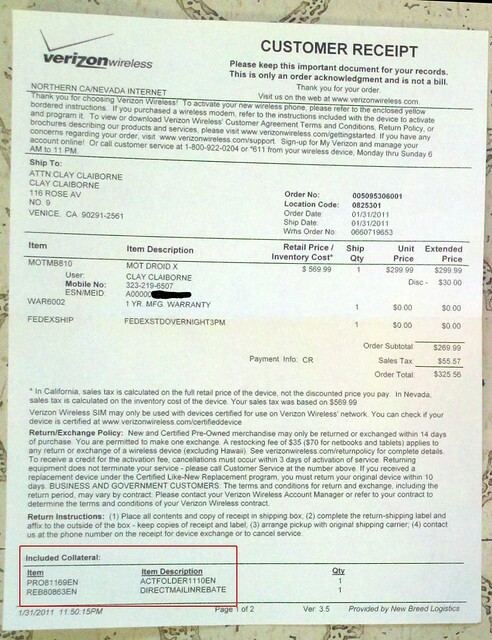 Mike said the Verizon records showed I was charged $325.56 and no rebate. So Mike had been misleading me about the rebate already being applied. No rebate had been applied and all I had was this bogus rebate denied postcard. Mike promised to look into the matter and get back to me in a few days. Mike never did. I think that Verizon is trying to cheat me out of $100.00 and I think this is their corporate policy. Rebates aren't a way to give you a lower price. They are a way to make you think you can get a lower price and then not giving it to you. That's why they set up a bunch of hoops that you have to jump through in the hopes that you won't. Those are the rebate rules. I don't like them but I understand them. In a case like that, when you jump through all their hoops and they try to cheat you anyway, well that's just not cricket. More and more I feel like dealing with a company like Verizon is like dealing with a bunch of crooks and liars. So I am putting this question to my fellow Kossacks: How should I deal with this? Obviously, I'm now out much more than $100. The minute I had to talk Mike I was wasting time that was not part of the bargain. Now clearly I will have to invest much more time to get justice in this case. So I would like to proceed in such a way that not only am I made whole, but I also discourage Verizon from making such tactics a regular part of their business plan. I will file a complaint with my credit card company. I will let you know how they handle it. I am also looking for other agencies, maybe consumer protection or utility regulators where I can file a complaint. I don't intend to take this stuff anymore. Thanks to the advice and support of second gen I hope to be getting my rebate card in a couple of weeks. When I went to the web address on the card the website said it couldn't find my rebate based on last name of rebate #. When I called the number on the postcard and worked my way through the menus, it told me that my rebate was denied because of an invalid purchase date. But when I called that number and followed the menu suggestions of second gen I got a live person that seemed to know all about my problem. There were none of the usual identifying questions. I guess he knew who I was from my home number, from which I dialed. He went away for about 5 minutes, then came back and said I would be receiving my rebate card in about 15 days. Sorry for the problem. I couldn't find out much about the problem, and the Verizon rebate guy was a little vague. First he said, "They must have given you wrong rebate form in the store." "But I bought it on-line." "Then they must have put the wrong form in the box." He couldn't explain what was wrong with the form. As you can see above the purchase date is not invalid according to this form. "Did this happen to a lost of people? Was the wrong form put in a lot of boxes, or was it just me?" "It happened to a lot of people." "So why didn't you fix it when you discovered the error?" "You just wait until they call in to complain?" 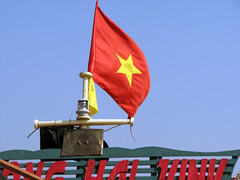 "We wait till they call in"
There in lies the real criminality IMHO. I finally got my $100 rebate card from Verzon but it took this long to get. As you have read above they finally agreed that they had made an error and promised I would receive my rebate card in two weeks. When it arrived it was for $50.00 not the $100.00 I had been promised. So I filed dispute with Chase Bank, my credit card company and called Verizon again. Needless to say all of this took a lot more time on the phone, a certified letter and a trip to the post office. The guy I talked to at Verizon agreed that another mistake had been made and I should have received a hundred dollar card. He promised I would receive that in two weeks and I did. So now, after 4 months and far more than a hundred dollars of my time I finally have my rebate. Provided, of course, that the card is good.